This is one of my Duets for 3 candles. I've been trying to make more smaller pieces for Xmas stock. These actually take ages to make; because they're small they're more intimate so all the detail has to be spot on. I wasn't going to use turquoise in this colour scheme but I was holding some glass drops up to the piece to see if I wanted to use them and the turquoise was attached and suddenly they made the other colours sing louder. 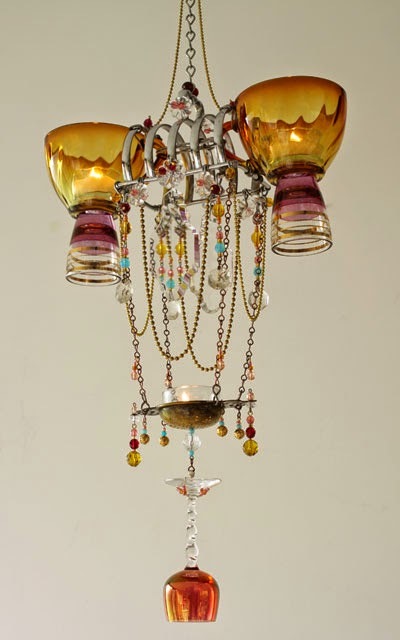 I'm thrilled to still be having these happy accidents even after 20 years plus of making my chandeliers because that's really the root of the way I've been working and I love a solution that I couldn't have planned. This is for sale for £295, you can contact me on the e-mail address on my website here. Info on size here, scroll down. i just spent about half an hour visiting your many beautiful chandeliers. what fun. i have been a follower of your blog for a while and may even have left a comment once or twice. but just wanted to say again, your work is lovely. i have seen chandeliers that are 'similar' to yours, in the area where we live (northern california, near san francisco) but yours are more beautiful. QUESTION: i could not tell by looking at the photos, but do you drill holes through the glassware to attach them? or do you use an industrial glue? i tried to enlarge the photo images to see if i could tell, but could not. anyway they are wonderful. your new apartment looks great also. lots of light? hope it fits you and your style for many years to come. take care. keep making beautiful chandeliers. ps: i work in assemblage as well, if you have a chance do stop by by blog and have a look. Hi Rebecca, THANK YOU. I have thought abut drilling holes in glass but if you do so you create a weakness - at least in my work it would so - so far I haven't even though in some cases it would be better visually. I use glass glue that bonds in UV light, but I do very little bonding, just where it's essential. My studio (not apartment) is ok for light, it's northern which I like, very soft - of course I would love more space for my boxes of materials but it will do nicely for now - I think you may understand this as I just looked at our blog and I'm sure you have boxes and boxes of stuff too!